This stainless steel anchorage point - which rotates a full 360° - is simply screwed into a pre-drilled threaded bore. It can be installed on steel subsurfaces that are at least 8 mm thick. This anchor, which is suitable for wind turbines (EN 50308), is supplied in yellow. Other colours are available upon request. Our ABS-Lock III-R-ST is a high-quality anchorage point with a 360° rotating anchorage eyelet which makes working around the anchorage point easy. Our ABS-Lock III-R-ST for steel structures greatly reduces the risk of twisting your lanyard or getting your carabiner hook jammed in the wrong position. This fall protection device really comes into its own in restricted working environments, such as on a wind turbine or industrial machine. Our anchorage device is supplied in standard yellow (RAL 1003) - not just because this make it really easy to see but because this is mandatory for wind turbine usage. Our ABS-Lock III-R-ST is simply screwed into a pre-drilled threaded bore. It has been specially certified for use on wind turbines. However, it can also be implemented in any other working environment with a load-bearing steel structure. 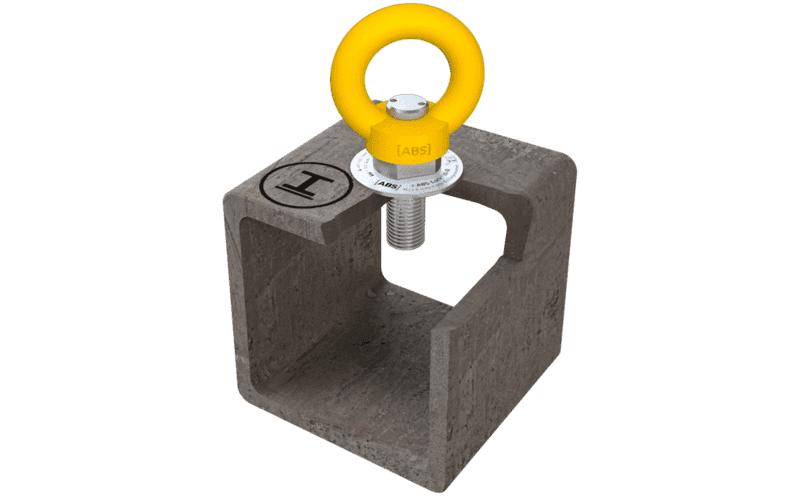 Our anchorage point can easily cope with any direction of load and can be used to secure up to 2 individuals working on a wind turbine (in accordance with EN 50308). For all other working environments, our system has been tested in accordance with CEN/TS 16415:2013 for simultaneous usage by 3 individuals.